In the early 19th century, coinage in Britsh North America consisted of scarce English coinage combined with coinage from other countries such as Spain, Mexico and the U.S., as well as privately issued coins. It was clearly time for the colonies to have their own coinage issued. To that end, Sir Francis Hicks helped to introduce a series of acts, starting in 1850 that evenutally led to the issuance of Canada's own currency - including a decimal-based penny! The 1858 and 1859 pennies featured a very youthful looking Queen Victoria with a laurel wreath in her hair. The design of these coins was done by Leonard C. Wyon. Narrow 9 - many of the coins were punched normally (not an overstrike on an 8) and these coins are worth the least - althought still decently valuable. Double Punch #1 - Some of the coins were double punched 9 over 9 - no 8's involved! This led to two different appearances, but both look messier than the 9 punched over 8, wide 9 as listed above. Variant #1 has the tail of the 9 attached to the upper loop - sometimes mistaken for 9 punched over 8, wide 9. This type is the most valuable of the 1859 pennies! Double Punch #2 - This is the same as #1 above, except there is a gap between the bottom of the tail of the 9 and the upper loop. The reverse of the coin was modified to show small leaves instead of the previous larger leaves. In 1911, the penny and other coins (nickle, dime, quarter and 50 cent piece) were missing DEI GRATIA ("by the grace of God") and the public took notice and complained. These were referred to as "Godless" coins, and in 1912 the words DEI GRA appeared (an acceptable abbreviation). In 1920, the coins changed from a large diameter of 1 inch to a small diameter of 3/4 inch (19.05mm) in order to save copper and to have the Canadian penny be the same size as the American penny. Over the years, many versions of the Canadian penny have a small "H" located somewhere on the reverse side of the coin (the side opposite to the image of the King or Queen) - these are Heaton issues which were produced at the Birmingham Mint instead of the Royal Mint in London (the coins of which had no such marking). Again in 1985 there was a blunt 5 and a pointed 5. What is with these guys and years ending in 5?? 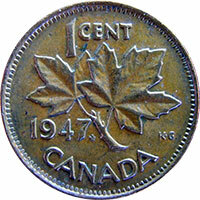 This history has initially been compiled to assist those using the "What is my penny worth?" page as there are variations of pennies within certain given years. I will expand this history to be more inclusive as time goes on. Thank you!